Enter your information to download the Maximize Your Performance report — ABSOLUTELY FREE! In this free report you'll learn the skills and methods you need to increase your productivity and performance, and improve the rate at which you get things done. Identify and focus on your key result areas that will produce the greatest output for yourself and your work. Set deadlines for important goals and stick to them! Get more things done — faster! 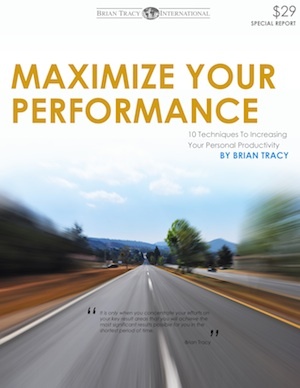 You'll also receive a new issue of Brian Tracy's Personal Success Newsletter weekly! And you're under NO obligation! You can unsubscribe at ANY time! Copyright© Brian Tracy International. All Rights Reserved. We hate spam too, so don't worry. Your info is safe with us.